The value wheelbarrow for the handyman. The Handipour will give good service for light building and construction and serious DIY. The design is a NZ classic, well balanced, pourer tray. Same geometry as the Tradesman. Hot-dip galvanised legs and braces. 4 ply tyres – 16x4.80/4.00-8 tyre. 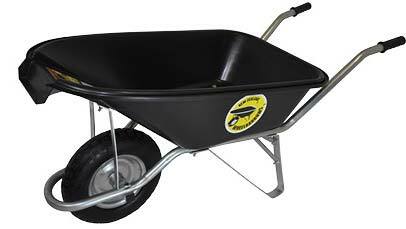 "The Handipour wheelbarrow offers outstanding good value. We developed and put it together here in our factory in Thames for all New Zealand handymen. The Handipour wheelbarrow will give you great service; just like I do!"